In the next days the parliament will vote on a new law. This racist law is directed aggressively against refugees. • “Special reception camps” for people from “secure” countries of origin, or people who are accused to have destroyed their documents, will be opened. In these camps the asylum procedure should be completed in three weeks with the aim to deport people faster. • People coming from a country where there is war and who have the status of ‘Subsidiary Protection’ shall not be allowed to bring their family from abroad during the first two years of their stay. • Deportations of people who are sick will be easier. 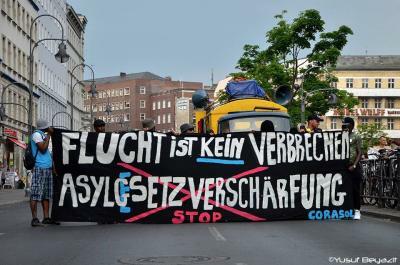 Illnesses that people had already before they came to Germany will not be an obstacle to deportations anymore. • Algeria, Tunesia and Marokko shall be declared as secure countries of origin in order to deport people more easily. This Asylum Package II is an act of isolationist politics and division! Let us not be played off against each other! Let’s get on the streets and be loud against these racist laws, against the violence of camp security and against the Lagers! For the right to stay and the right to family for everyone!